The Gripsholm stopped in South Africa and Rio de Janeiro before arriving in New York on December 2, 1943. (In the story, for obvious dramatic reasons, I’ve delayed the arrival for three weeks.) 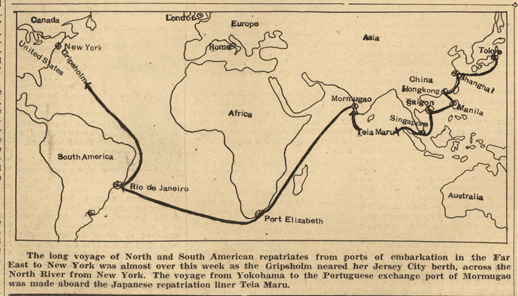 The voyage was well publicized, being reported in most major newspapers, Life Magazine, and the New Yorker($$$). The Canadians were put on a special train and arrived home the next day. The two nurses returned to Toronto (Kay) and Winnipeg (Anna May) and after gaining back the weight they lost during their imprisonment, returned to war service. Some folks from the Swedish American Line maintain a website (in English) that has a wealth of information on the history of the company, and in particular the exchange and repatriation voyages.